Tulip 37ml Glow Fabric Paint	There are 8 products. 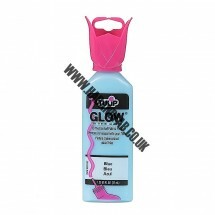 1 * Tulip 3D Fabric Paint Glow 37ml - Blue. See our Dylon and Pebeo range on our site too. 1 * Tulip 3D Fabric Paint Glow 37ml - Fluorescent Green. See our Dylon and Pebeo range on our site too. 1 * Tulip 3D Fabric Paint Glow 37ml - Fluorescent Orange See our Dylon and Pebeo range on our site too. 1 * Tulip 3D Fabric Paint Glow 37ml - Grey. See our Dylon and Pebeo range on our site too. 1 * Tulip 3D Fabric Paint Glow 37ml - Natural. See our Dylon and Pebeo 3D range on our site too. Tulip paints continue to be popular because of their high quality, strong adhesion and durability on wood, glass, fabric, ceramics, and more! 1 * Tulip 3D Fabric Paint Glow 37ml - Pink. See our Dylon and Pebeo range on our site too. 1 * Tulip 3D Fabric Paint Glow 37ml - Purple. See our Dylon and Pebeo range on our site too. 1 * Tulip 3D Fabric Paint Glow 37ml - Red. See our Dylon and Pebeo range on our site too.